In 2010, an Air Force CV-22 Osprey tiltrotor — a hybrid warplane that takes off like a helicopter and cruises like an airplane — crashed in southern Afghanistan, killing four people on board. When Brig. 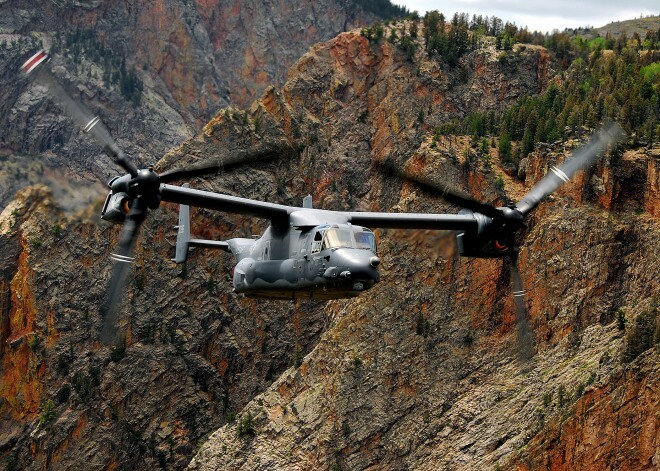 Gen. Don Harvel, the lead accident investigator, concluded that engine failure might have been to blame for the Osprey’s loss, he was overruled by a superior officer who Harvel says was eager to protect the military’s $36 billion investment in the controversial V-22. Harvel finally retired this summer and, in his first major interview with U.S.media since the accident, accused the Pentagon of “trying to turn all eyes away” from the Osprey’s ongoing safety woes, which have contributed to a dozen or more crashes or other dangerous incidents since the speedy warplane with the rotating engine nacelles was redesigned between 2001 and 2005. But one Air Force engineer and veteran of the Osprey program, who also examined the 2010 crash data, tells Danger Room that Harvel misinterpreted the facts surrounding the V-22′s fatal tumble — and then followed flawed assumptions to incorrect conclusions regarding the Osprey’s airworthiness. “Gen. Harvel was wrong,” says Eric Braganca, recently retired as the Air Force’s chief V-22 systems engineer. “I do not understand why such highly capable warriors crashed what appeared to be a fully functional aircraft,” Braganca adds. After visiting Afghanistan to interview crash survivors, and reviewing video of the V-22′s final seconds in flight (shot by an escorting A-10 attack plane), Harvel concluded that the Osprey’s engines possibly failed as it was coming in for a landing. He based this assessment in part on puffs of smoke that could be seen coming from the tiltrotor’s nacelles before it slammed into the ground — apparent evidence that the crew was trying to restart stalled motors. It was the claim of engine problems that raised the ire of the V-22′s defenders, who for years have fought back against accusations that the tiltrotor’s multimillion-dollar engines are prone to fires, failures and maintenance problems. Harvel says his boss, Lt. Gen. Kurt Cichowski, ordered him to omit references to engine failure from the final crash report. Harvel refused. “I turned [my report] in and I knew that my career was done,” Harvel tells Danger Room. Cichowski sought a second opinion about the crash from a team of Air Force and Navy engineers, including Braganca. The engineers did not travel to Afghanistan like Harvel did. Instead, they analyzed crash data on paper and ruled out engine failure. Cichowksi approved of their conclusion and included it in his official rebuttal of Harvel’s report. “The puffs of smoke that Harvel saw on the video are common occurrences and were not timed within the three-second window before impact,” Braganca adds. According to him, the puffs were a red herring — an artifact of normally operating engines that only appeared alarming to an misinformed investigator. But Harvel says he based his conclusion on more than the smoke puffs. Harvel tells Danger Room his team also closely analyzed the video of the crash and were able to count the RPMs of the V-22′s rotors. They concluded the engines were functioning at 92 percent, a figure Harvel says was corroborated by the pattern of rotor gashes in the earth where the Osprey struck ground. “These engines should always be at 100 percent,” Harvel explains. He insists they weren’t that fateful night over southern Afghanistan. Braganca says the evidence leads him just about the opposite direction. He believes his friends — the crew of that Osprey, some of who he trained himself — must have contributed to the aircraft’s crash “Despite having a highly experienced pilot and flight engineer, a normally functioning aircraft crashed and four people died,” he says. Braganca agrees that Osprey models from the 1990s and early 2000s suffered from a “rush to field” on the part of an over-eager Pentagon. But the redesigned model is different. “The safety record since 2001 has been very good,” he asserts, despite evidence that the Marines and Air Force have downplayed multiple worrying incidents.